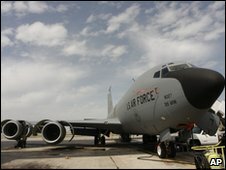 Kyrgyzstan's interim government says it will extend the US lease on a key air base, a day after the ousted president, Kurmanbek Bakiyev, left the country. The deputy leader, Omurbek Tekebayev, said the agreement over Manas air force base - a logistics hub for Afghanistan - would extend for another year. The US had feared that the change of government in the Central Asian nation could affect the base deal. On Thursday, the ousted leader flew to Kazakhstan, easing fears of violence. He was overthrown in mass protests on 7 April. More than 80 people were killed when anti-government protests in the capital, Bishkek, and other towns turned violent. "Kyrgyzstan is extending by one year the validity of the agreement with the United States over the Manas transit centre," Mr Tekebayev said. He said that parliament should make its own decision on the base but that because there was currently no parliament in place the lease, which runs out in July, would automatically be renewed. The announcement came only hours after Mr Bakiyev agreed to leave, formally resigning from neighbouring Kazakhstan. He had initially refused to stand down, instead retreating to his home in the south of the country and attempting to rally supporters. 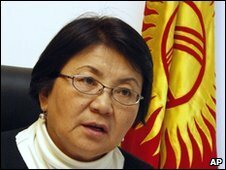 Addressing the nation, interim leader Roza Otunbayeva said he had been allowed to leave to avoid bloodshed. She said his speeches in the south "in the company of militants armed to the teeth brought the country to the brink of a civil war". "Under these circumstances, with the active mediation of peace missions from the OSCE and the UN and the personal participation of Kazakh President Nursultan Nazarbayev, US President Barack Obama and Russian President Dmitry Medvedev, the interim government was presented with the need to take urgent decisive measures," she said. She promised that Mr Bakiyev would be held accountable for the deaths of 7 April. "Bakiyev will not avoid justice. He will not be able to hide in any country of the world," she said. Correspondents say there is considerable anger against Mr Bakiyev in Bishkek over the violence. Since his departure, the interim government has been consolidating its power. A warrant has been issued for one of Mr Bakiyev's brothers, Zhanybek, the former head of the presidential guard service who is accused of ordering troops to open fire on protesters on 7 April in Bishkek. Other relatives of Mr Bakiyev handed weapons to officials in the family stronghold in the south of the country. The former defence minister, Baktybek Kaliyev, has already been arrested.